Brand: Fox Run FR-57157 Units: 2/pkg. Mold hard boiled eggs into fun shapes! 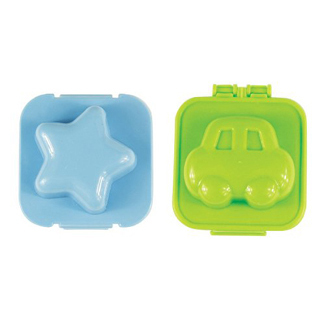 Package includes 2 molds that are approximately 2" x 2" x 1 3/4" each in size. To use the molds, hard boil eggs, peel the shell off while the egg is still warm and place in the mold, close the mold and place in cold water for 10 minutes. Mold can also be used to shape cake pops and cereal treats. Dishwasher safe. Mold hard boiled eggs into fun shapes! Package includes 2 molds that are approximately 2" x 2" x 1 3/4" each in size. To use the molds, hard boil eggs, peel the shell off while the egg is still warm and place in the mold, close the mold and place in cold water for 10 minutes. Mold can also be used to shape cake pops and cereal treats. Dishwasher safe.